So I have always wondered whether regular whole-wheat chappati flour or atta could be used for baking. 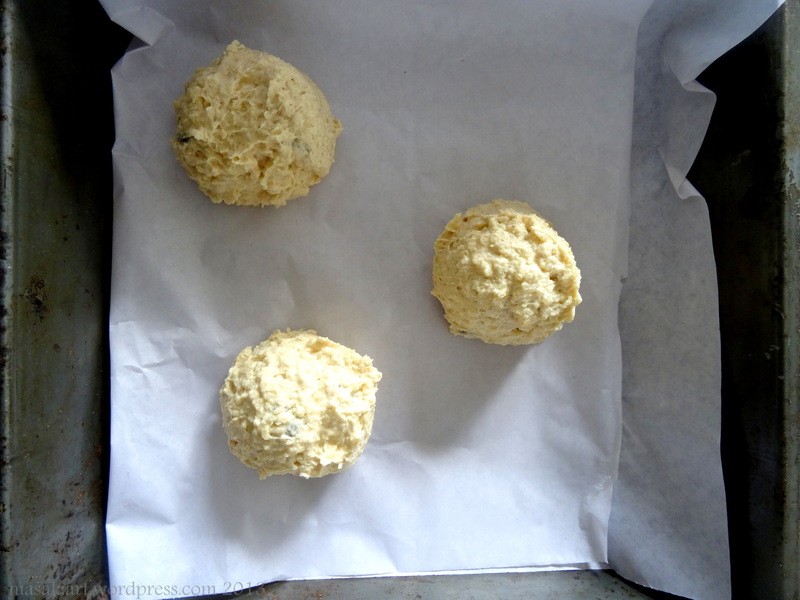 I used atta to make crackers earlier, and they turned out great; but then, crackers are meant to be a little hard and dry. Could atta be used for sweeter baked goods? I tried this jaggery and sesame cake once, and came across a video for atta and yogurt cake, which shows a soft, fluffy cake. But cookies? I was still not convinced. As I was browsing We Heart It for chocolate chip cookie pictures I found one which linked to Baked Bree, and fell in with her whole grain chocolate chip cookie. 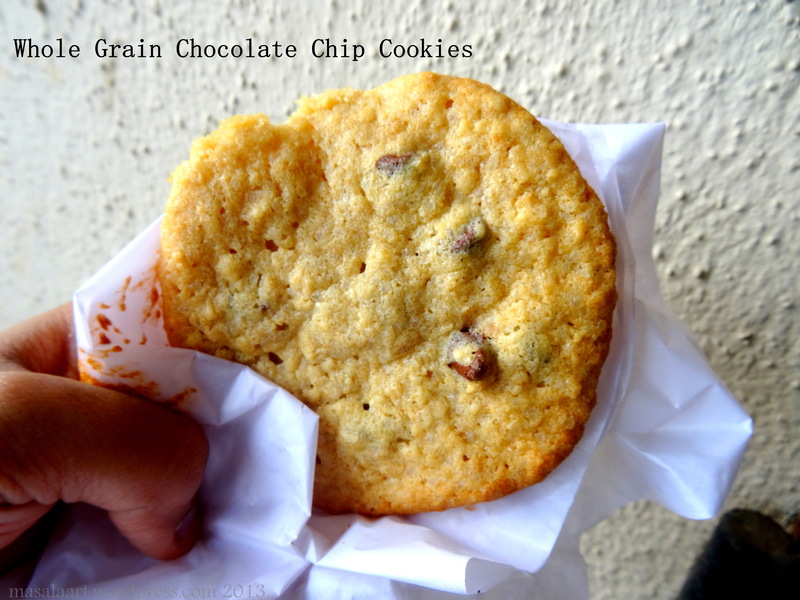 It had oats, which I think work well in cookies because they give it an extra bit of chew and crunch. And of course, they looked too good not to try, and chocolate chippers are pretty easygoing when it comes to the ingredients list. I substituted some ingredients, but had most of what I needed in the pantry. In an earlier post, I told you how much I love my ice-cream scoop for portioning cookie dough. I got excited (a little too excited,) with my ice-cream scoop and plopped down scoopfulls of cookie dough. I realized these wouldn’t all fit on the tray, so I removed one scoop and settled for two. Not good enough. Because those scoops were pretty darn big. That’s a lot of dough in one scoop. Lesson learnt: when you scoop big, your cookies bake big. Like so. This cookie proves that atta can produce wonderful results! My family and friends ate them, and none of them could believe I used the same atta we use for roti and parantha. 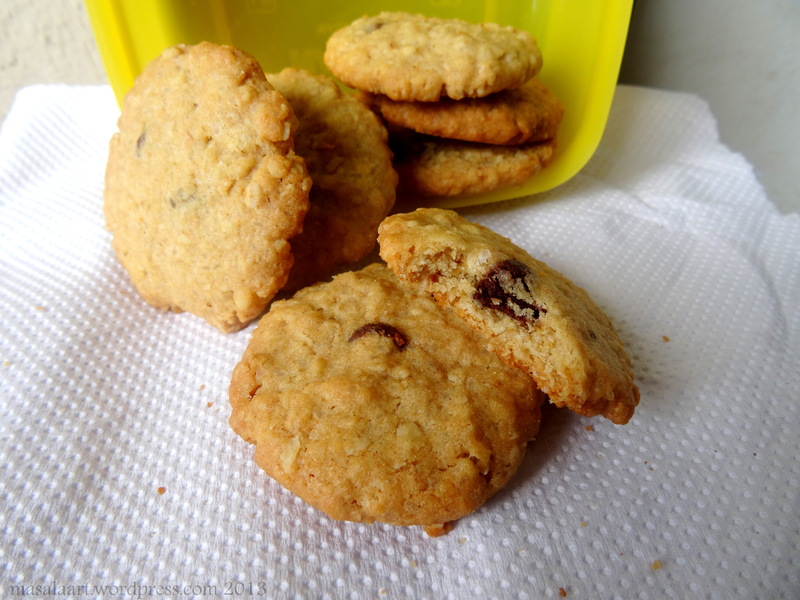 NOTE: I used ground demerara sugar for this cookie as well, and I substituted the rolled oats with quick cooking oats. And I also skipped the baking soda. In a bowl, whisk together the flour, baking powder and oats and set aside. Crack in one egg at a time and beat well. Add the flour mixture and beat until there are no streaks of flour in the cookie dough. Fold in the chocolate chips and mix well until combined evenly. Spoon even scoops of the batter about 2 inches apart on a baking sheet and bake at 180 C for 12 to fifteen minutes. As you can see, the second batch turned out smaller because I scooped half-tablespoon sized mounds of cookie dough. These were a little crisper, but still chewy in the middle. 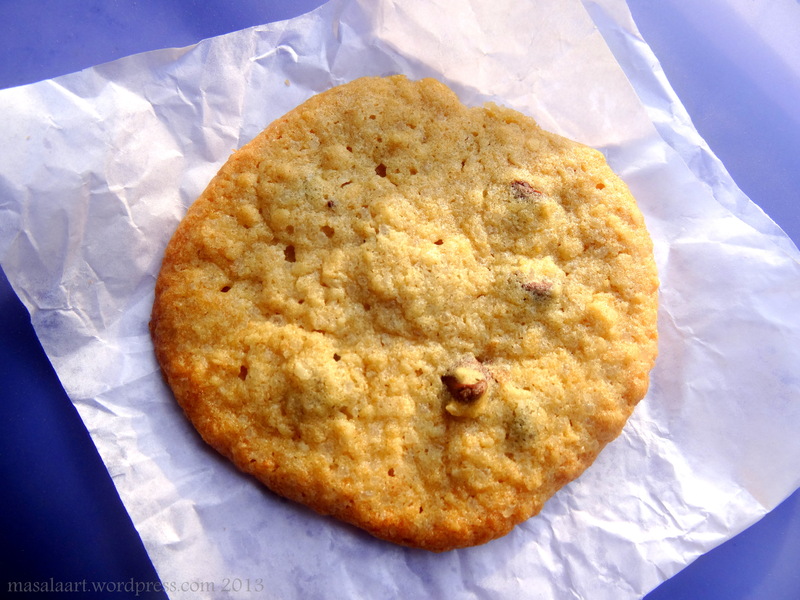 Whether you prefer a giant cookie or a smaller one, these make for a great treat- and the nibbly oat bits make them really filling, too. Great for dunking in a glass of cold milk or eating as is.